If you’re fed up with high AC/heating bills (and someone always leaving it on while no one’s home! ), find your solution with Nest. Nest isn’t your ordinary thermostat. Instead of being at the mercy of whatever setting the thermostat does, Nest puts you in control of your household temperature (and bills!) at all times. The user-friendly controls on the device and the mobility of phone and tablet apps allows you to track and adjust the Nest whenever you please. Forgetting to turn down the AC when you leave for work will never be a problem again! In addition to being just plain convenient and economical, Nest also reduces your carbon footprint. Thankfully, Nest doesn’t just reply on your constant attention to the thermostat. It gets to know what times you normally leave and return to the house and what temperatures you set at those times. 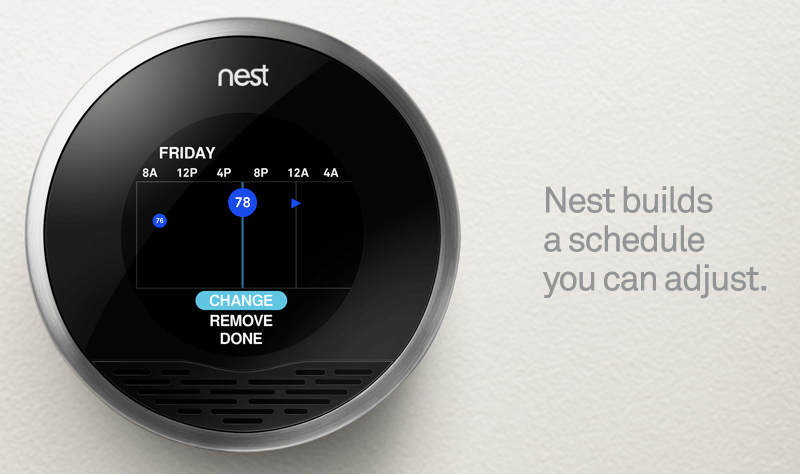 Based on this learned information, Nest builds a schedule based on what you need! Track how Nest has helped you and compare energy usage and bills with the Energy History function. Find out which temperatures work best for you to keep you within budget. Nest practically pays for itself! Would you use Nest in your home? Do you think it’s a good startup concept? Tell us your thoughts in a comment and connect with us on Facebook & Twitter!